Autumn is now in full swing with noticeably cooler temperatures (great news for our no-AC house) and Italians dressed up in their boots and marshmallow jackets. We’re finally back in Rome and that means I’m back to blogging comfortably from our home office with no Jaime breathing down my neck about wanting the computer :). Just kidding, I love him. Even though fall is here, I’m not quite ready to stop dreaming about our amazing summer in Italy. 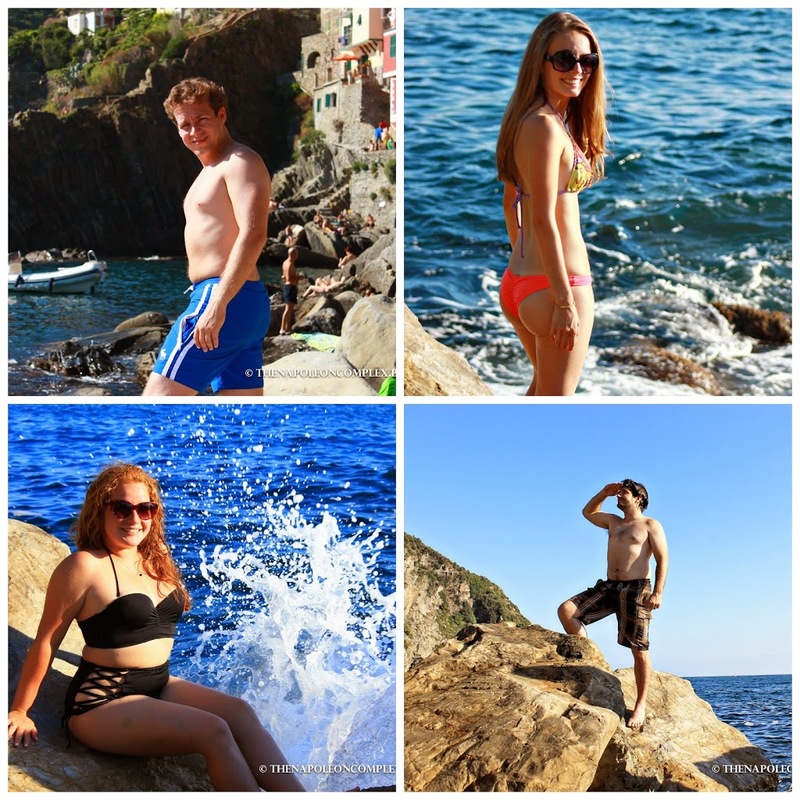 So today, I’ll be continuing our summer road trip to Italy with our last day in Cinque Terre. I hope you guys aren’t too tired about reading this because these are my favorite pictures of the whole weekend! 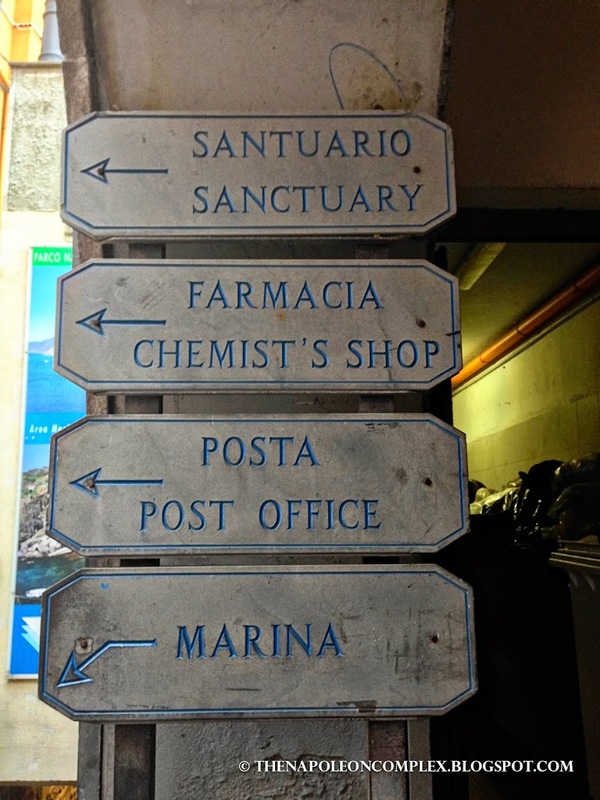 The last village we visited was the southernmost village of Riomaggiore. 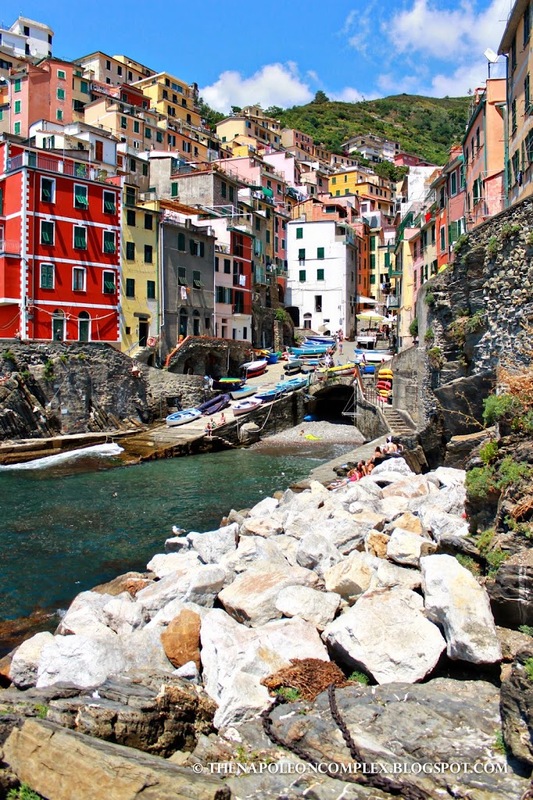 For me, Riomaggiore tied with Manarola for picturesque-ness (nice word, huh?). When we exited the train station, we were almost immediately welcomed by the main road that leads directly to the bay, where people were swimming. We walked around a little bit, ate lunch, snapped a few pictures, and then decided to quickly go back to the hotel and change into our bathing suits to take advantage of the sun and the water. How cute was this sign? Notice “Chemist’s Shop” is the pharmacy. We spent the afternoon laying on the rocks and swimming (well, Jaime, Carolina & Joaquin were swimming, I was tanning and going camera trigger-happy). I could’ve spent days taking pictures of this village, it was that beautiful. We stayed until sunset, and that’s when I could’ve died and gone to heaven. The sun sets to the left of the village if you’re looking at it from the rocks, illuminating the edges of the colorful houses. If you’re going to take pictures, you definitely need to know some technical settings on the camera to get the perfect shot. One of my favorites Joaquin took of me with his iPhone. We had a blast taking pictures, while another couple had dinner and drank wine a few rocks away from us (Carolina and I were swooning at the guy’s romantic gestures). Cute selfie. Jaime’s look of concentration is hilarious. 1. Where to Stay. Plan in advance. By in advance, I mean like at least 6 months before, especially if you’re planning a trip overseas. 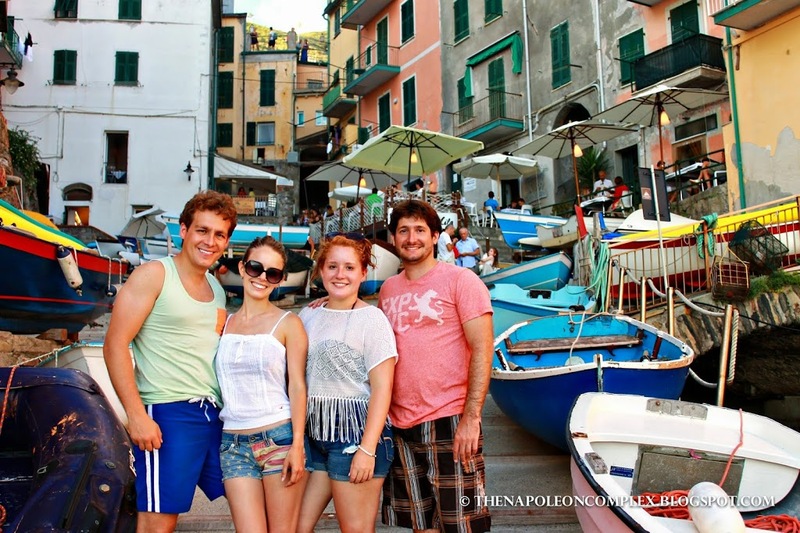 By the time we were looking to book a place to stay, most of the decently priced Home Away apartments in Cinque Terre were booked, so we had to stay in La Spezia, a small city near Riomaggiore. 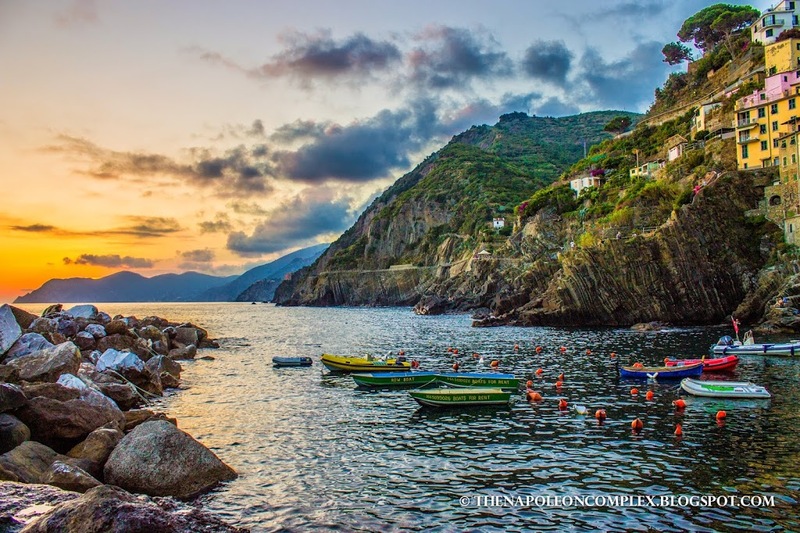 While taking a train into Cinque Terre was no big deal (it was only a 10 minute trip to Riomaggiore), La Spezia is not the first picture you want in your memory of Cinque Terre. Plus, our hotel was horrible, but that’s another story. 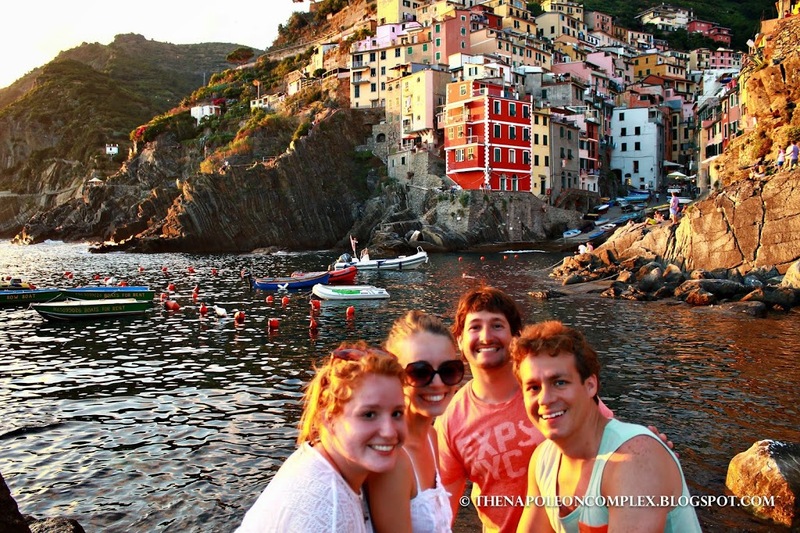 Our advice is to stay in Cinque Terre, even if it’s a little more expensive. It’s nicer and you’ll probably end up making up the difference in travel fare in the long run. 2. Transportation. Cinque Terre is a National Park, so you cannot drive inside each of the villages. However, you can drive to each village and park outside, which we did on our last day. 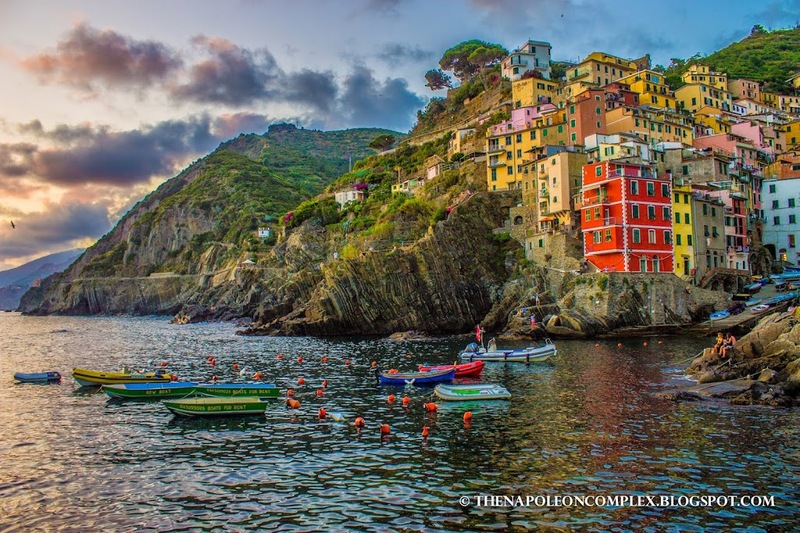 Depending on the time of year you’re going and the number of people in your family it might just be cheaper to do that then buy the Cinque Terre card that gives you unlimited train access to the villages. 3. Cinque Terre Card. A note on the Cinque Terre card: for access to just the hiking trails, the card costs 7.50€ for one day and 14.50€ for two days (adult fare). For that plus unlimited train access between the villages (and La Spezia) it’s 12€ for one day and 23€ for two days. You can see that it’s not exactly cheap. If you’re not planning on hiking the trails (especially since about half the main hiking trail has been closed due to the storms that battered the villages in 2011), it’s almost not worth it to buy the card and just pay for individual train tickets. Like I said, you need to do a thorough cost estimation of what you’re going to need for your specific situation. 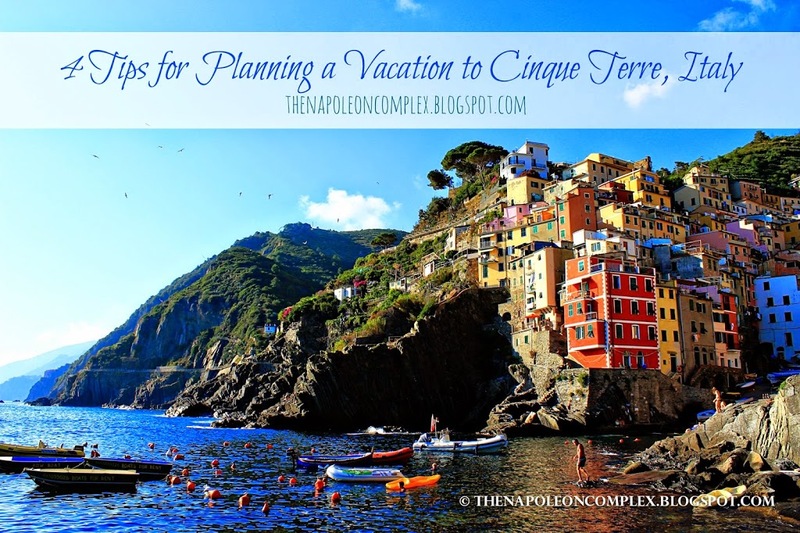 On our part, we bought the Cinque Terre card thinking that we might do the hiking trails and we ended up not using them except for the train, so we barely broke even. 4. Relax and have fun! There’s not a ton of things to do in Cinque Terre except soak up the sun, eat some good food, and drink some amazing wine. And that’s okay! You’re not wasting your vacation if you don’t spend every moment of it standing in some line to get into some museum. You’re still seeing first hand a piece of Italy that cannot be replicated anywhere in the world! Thanks for reading and if you like any of the pictures, don’t forget to pin them for travel inspiration! I’ll also post up more pictures of Cinque Terre on My Napoleon Complex’s Facebook page. – 24 Hours in Milan! Oh my. Your pictures are UNREAL! I want to go to Cinque Terre so badly it’s stupid. What kind of camera do you use? Hi Courtney, thanks for commenting! We use a Canon Rebel T3i, but obviously the location helps a ton 🙂 Cinque Terre is definitely one of the most beautiful towns I’ve visited in Italy, if you ever have the opportunity to go, don’t hesitate, you won’t regret it! This makes me miss Italy!! 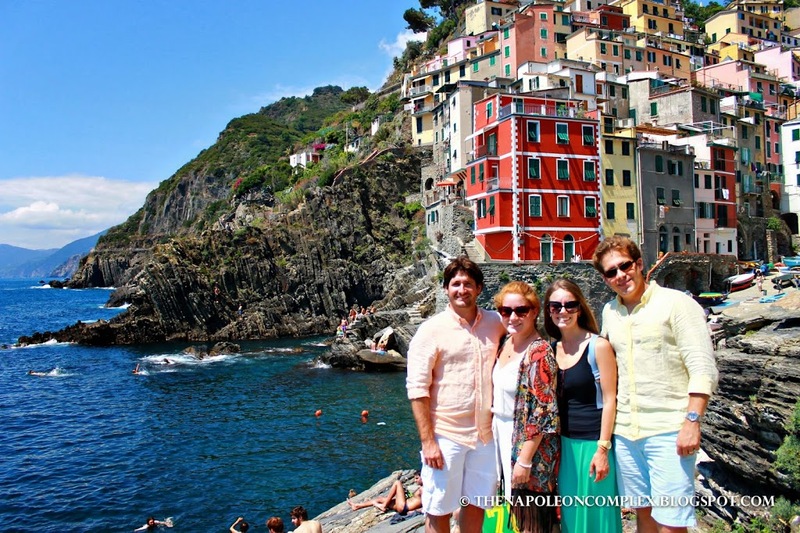 We loved our day trip out to Cinque Terre when my family came to visit, but wished it had been sunny like your time there! 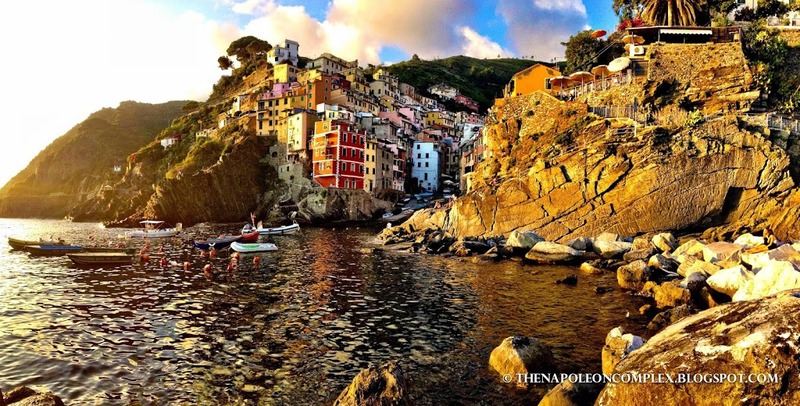 Either way, it’s such a beautiful part of the Italian Coastline…thanks for sharing your photos & tips! And thanks for linking up to the FFF blog hop this week!!! Have a fab one! Hi Casey, it was my pleasure! 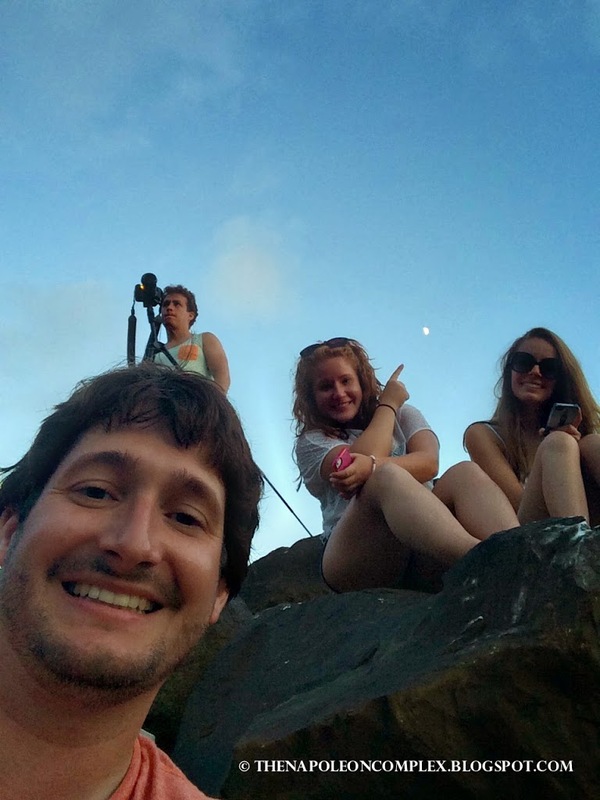 I’ve been following your blog for awhile now and I love reading about your adventures and seeing your great pictures! I’m still kinda new at the whole blogging thing so I’ve always been a little shy to leave a comment. Anyway, thanks for stopping by and hope you’re enjoying Florida!